Patrick Wang's IN THE FAMILY was rejected by 30 film festivals before making its premiere at the Hawaii International Film Festival and being distributed independently. The film, a remarkably stirring drama about the changing definition of “family,” has some technical peculiarities that may have kept it from initial consideration: it's long (nearly three hours), glacially paced in the early scenes, and some of the camera work is decidedly eccentric (actors shot at the edge of frames or moving out of frame). And yet the story is so powerful that these concerns are swept away; it draws you in and never loosens its grip. 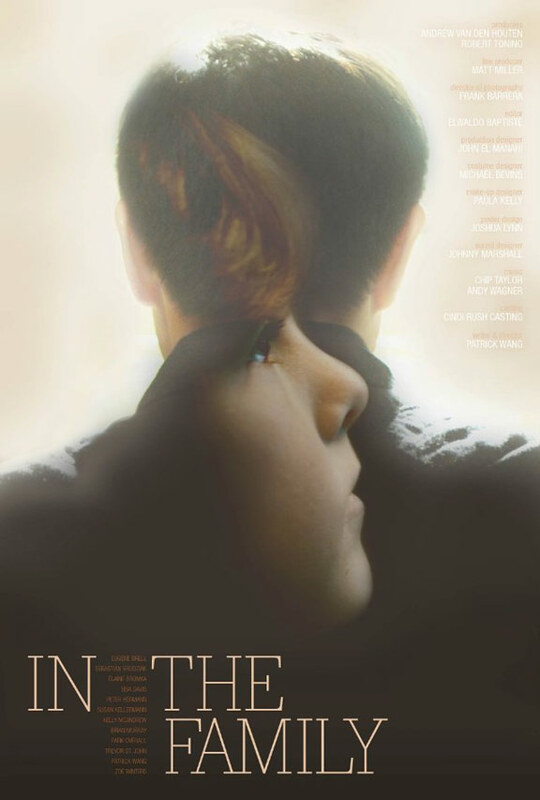 The film has been nominated for an Independent Spirit Award. Set in the small town of Martin, Tennessee, the story centers on a gay couple, the soft-spoken Joey Williams (Wang) and his partner, Cody Hines (Trevor St. John), who are raising Cody's precocious 6-year-old son, Chip (Sebastian Banes). When Cody dies in a car accident, Joey, known to Chip as “Dad” (his natural father was “Pop”), finds himself in a battle with Cody's sister Eileen (Kelly McAndrew), whom Cody had named as Chip's guardian. Cody's family, whose mistrust of Joey – based on their non-acceptance of Cody's gay relationship, and perhaps also on ethnic prejudice – remove Cody from Joey's house, leaving Joey, with the support of his friends, to find a way to reunite his family, despite the fact that the law does not favor his position.“You do not have a child custody case,” says one of the many lawyers who refuse to take his case. Much of the film's power resides in Wang's sensitive, naturalistic screenplay, which effectively illustrates the everyday domestic life of a nontraditional family -- extraordinary for its sheer ordinariness. Cody, a math teacher, and Joey, a talented architectural designer, have a dedicated interest in young Chip's development. Chip is fond of dragons, so “Pop” Cody helps him research them online, while “Dad” Joey fashions him a special wooden block depicting each day's dragon. (Any child would be lucky to have two such attentive dads.) The acting, too, could not be better. Wang, a stage actor with a low-key manner and incongruous Southern drawl, is wonderfully sympathetic, and classical actor Brian Murray is superb as the retired lawyer who agrees to represent Joey in his improbable case. The scene in which Joey stands up to harsh deposition questioning about his background (he was an orphan whose foster parents also died), and his reasons for wanting to fight for Chip, is quietly shattering. 3 1/2 out of 4 stars.